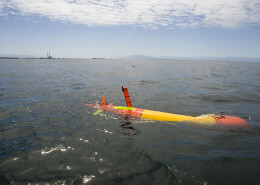 Electrical power for instrumentation, communication, and propulsion for autonomous oceanographic monitoring and experimentation can be a significant limiter of what can be done. Although the ongoing trend of lower power electronics helps, there are some physical limitations that cannot be overcome. Examples are the energy needed for the propulsion of mobile platforms, the energy needed for radio communications, and the energy needed for processes required by some instrumentation such as heating and the pumping of fluids. For these reasons any advances in energy storage or capture that can be applied to the types of platforms used in oceanographic research can create significant advances in capabilities. A range of projects at MBARI are working to address these issues, some involve developing lower power techniques for the needed processes, some involve creating ways to efficiently store energy, and some involve the capture of energy from the oceanographic environment. Taking advantage of lower power electronics as they become available happens naturally as each project cycle progresses, but there are also opportunities such as careful engineering of mobile platforms for minimum drag. The long-range AUV project at MBARI is a good example of this where the hull shape and appendages were optimized for minimum drag and the propulsion system was engineered for peak efficiency. The most typical approach to improving energy storage capacities is the adaptation of improving battery technologies developed for the land-based commercial market. There are a myriad of engineering challenges associated with doing this in a manner that results in a safe and reliable system. The safety issues are of particular interest since the elements in modern batteries can react strongly with sea-water, so keeping them separated from the surrounding seawater in spite of the high ambient pressures present in some applications is particularly important. For applications that require yet higher energy storage capacities, fuel-cells are options but are very challenging to make work reliably for long durations in the oceanographic environment. Nevertheless, work has been done on this at MBARI and at other oceanographic institutions. Depending on the energy requirements of the platform, at some point it is not possible to store enough energy on-board for extended duration use, and it becomes necessary to capture energy from the environment during operation. Solar and wind solutions are fairly mature on oceanographic buoys, but are limited in their capacities due to the size constraints of these systems. 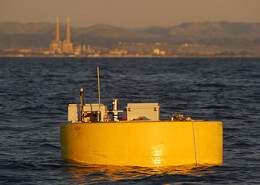 Wave-energy conversion allows higher amounts of power to be captured, but the devices are necessarily more complicated. Projects at MBARI have pursued all of these approaches for the generation of electrical energy. With regard to wave-energy, it is possible to use this energy source directly for propulsion of mobile platforms without first creating electricity. 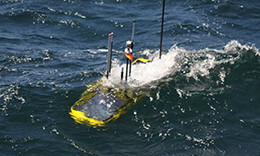 Platforms such as the Liquid Robotics Wave Glider platform does this and has been used extensively at MBARI in various projects to track underwater vehicles and to provide a communication link to shore for underwater vehicles. Even the most aggressive energy-capture and storage techniques make only modest amounts of power available. For higher power processes such as significant pumping, heating, or lighting, it is necessary to run a cable directly to shore and power instrumentation from shore based energy sources. 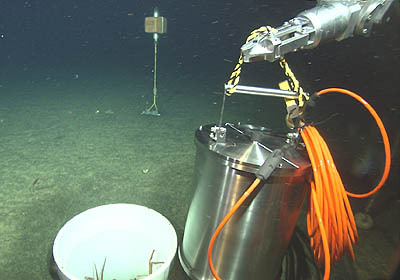 The MARS project at MBARI was a prototype system for this approach which has been expanded upon by the National Science Foundation’s Ocean Observing Initiative project. 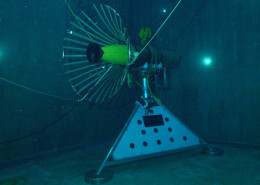 MARS remains operational and can provide kilo-Watts of power to seafloor based experiments. One of the major themes of MBARI’s current research is the increasing dependence on real-time data for informed decision-making during the course of field experiments. The power buoy has been in development for since 2009, and has been deployed and recovered six times over the past four years. Modifications after each deployment have increased the power buoy’s efficiency and the amount of time it can spend out in the ocean. 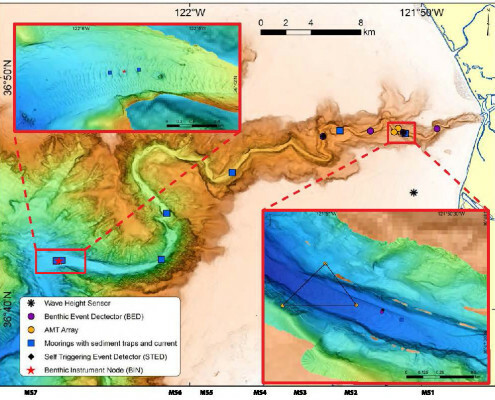 Sensor detects quakes from the far West side of the San Andreas fault on the Pacific plate.